With the further development of fish farming industry, extruded fish feeds have obtained more and more wide applications in virtue of unique advantages including high nutrient, good palatability, strong digestibility and so on. As a new technology to produce feed, extrusion processing means that in the environment of high temperature(110-200°C), high pressure(25-100kg/cm2) and high water content(10%-20%, even 30%), fish feed stuffs mixture, through heating tempering, deep mixing and particles formation, would puff and afterwards shape into extruded feed when out of fish feed extruder machine. On the basis of density variation and puffing degree, extruded fish feed can be segmented into floating fish feed and sinking fish feed. Currently, the floating feed is the most widely used extruded feed in fish farming, and it has relatively mature technology. 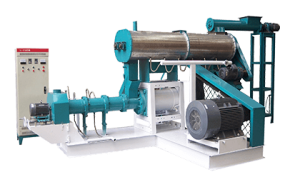 That is, floating extruded feed pellets are both produced through modulator for heating and modulation, via continuous mixing process to fish feed raw materials after entering extruder machine, heating up, pressurizing, ripening, extruding and then puffing and granulating. Compared with floating fish feed, sinking pellets has different requirement on fish feed manufacturing technique because of the diverse request for specific gravity, even if when they use the same fish feed machine. 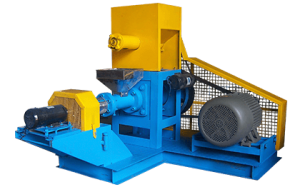 Briefly, fish feed extrusion process requires a hammer mill to grind raw materials, mixer to blend raw materials including vitamin-mineral premix, the wet type fish feed extruder with steam preconditioner (yes, steam is equired for quality pellets) and cutter head to shape the pellets, and finally a dryer-cooler to ensure pellet shelf-life and stability. There are many factors affecting the expansion situation of feed stuffs, but expansion is mainly closely related to tempering condition, operating conditions of extruder machine, property and shape of raw materials, which means changing the extruding conditions can control the floating and sinking status of extruded fish feed. 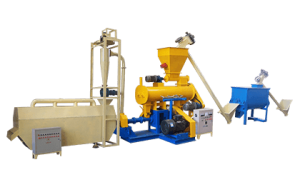 Tempering plays an important role in producing extruded fish feed. When producing extruded sinking feed, operators should weaken the intense effect of extruding and strengthen the function of tempering at the same time. It is necessary to add water and vapor when tempering, and prepare enough tempering time so as to make materials softening and ripening, creating condition for materials to reach better plasticity within puffing chamber in the next step. Thus, it will keep materials continue to ripen without generating too big puffing degree but getting sinking fish feed. So, the adequate tempering works well in promoting feed digestibility, water tolerance and extruding stability. Extruded sinking feed should adopt lower screw speed. That is because lower screw speed can not only provide the required extruding and shearing action, but without generating too high pressure, avoiding materials energy growing rapidly and leading to too large extrusion. The control to temperature in extruder chamber is another important aspect for controlling materials energy. When feed stuffs entering the melting section, operators need to heat the temperature reaching 120-125°C for shearing and mixture; then cooling the chamber (lowering temperature to 40-50°C) at tail end homogenizing section, lowering the supersaturation state of water content in materials, preventing too big puffing when materials enter atmosphere from die hole. Other than that the puffing degree of floating fish feed can reach to 2 or even 3, sinking extruded fish feed is often less than 1.3. The pressure in extruder chamber is relative to screw configuration, material character, mould aperture ratio and charging rate, etc. If aperture ratio is big, discharge flow would be bigger. In order to get suitable extruded sinking fish feed, it is possible to change the quantity of mould hole according to actual situations at trial-producing. Compared with traditional powdery compound feed and pelleted feed, extruded fish feed can well overcome some conventional disadvantages, such as bad water stability, feed disappearing and waste, water quality pollution and so forth. In especial, floating extruded feed makes feeding management convenient because aqua feed can float on water for a long time and there is no need to set feeding station, just at fixed point to feed. Moreover, fish farmers can observe the food intake situation of their fish, adjust feeding quantity timely and master fish growth and health status in time. In a word, extruded fish feed can contribute to scientific feeding and management, saving much time and boost labor productivity. So as the ideal fodder of modern aquaculture, extruded aqua feed has quite good market prospect and wide application fields. Generally, different aquatic culture animals have various ingestion features, and that is the principle should be followed when choosing diverse extruded fish feed types. For instance, river crab is accustomed to looking for food in water bottom and its eating speed is relatively slower, then aqua feed should not be too hard or too firm, and also need to reduce the loss in the nibble process. By this token, extruded sinking feed is more suitable for river crab because it is easy to soften in water and fit for nibble with longer water resistance time and less crumb loss, decreasing feed waste and water contamination. In addition to those benthonic animals, most aquaculture species can ingest floating extruded fish feed very well, not only for the famous-special fish species (like aquarium fish), but also for conventional cultivation (like grass crap, crucian, catfish, tilapia and so on). What’s more, in the aspect of breeding method, floating fish feed has more extensive applicability, that is to say, for pond fish farming, culturing fish in rice field, running water fish culture, cage culture, and especially for fish farm with lower breeding density, extruded floating feed has much more superiority than other fish feed.